Yay!! Here we are at the end of the new release week with My Creative Time. So, tell me, have you been inspired by all the FABULOUS ideas from the design team all week long?? I know that I have. We are having a blog hop today that starts at the My Creative Time blog, if you haven't yet and also check to see if you are one of the winners from the project showcase this week. Today I have a fun shadowbox frame to share with you that uses the new Celebrate Good Times stamp and die set. Isn't this fun?!? I think it will be perfect for an ice cream lover. I used the ice cream dies and "Ice cream = Happiness!" 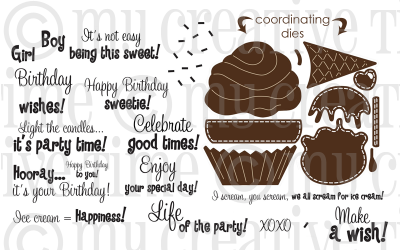 from the Celebrate Good Times set that is available now over in the My Creative Time store. I cut the large labels out with my Cricut and Once Upon A Princess cartridge. After adding some pen stitching, I punched some holes in both sides and then added some yummy bakers twine from The Twinery. To get the glossy look on the chocolate, I coated the dark brown cut outs with some Glossy Accents from Ranger. OMG This is adorable. I Love this one!!! So "sweet"! This is amazing...that fudge topping is so realistic! Yummy love this one, looks so real. This is just the cutest shadow box!! Fun colors and adorable stamps and dies!! Thanks for sharing a great week of projects! I love your project! It look so refreshing. Wow what a lovely project.Yummy. This is so cute. Love those stamps and dies. Love the cones & looks good enough to eat. I just got this set in yesterday. Love what you did with the chocolate on top. I can't wait to play too. So adorable, Amy! 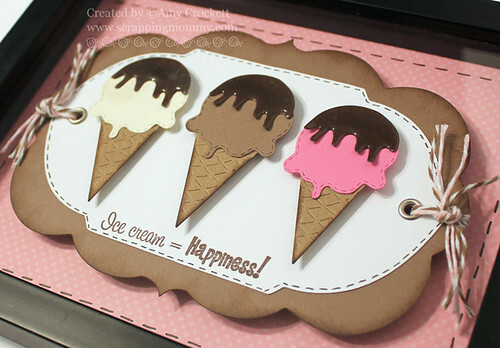 The frames you used are just perfect with the ice-cream cones! Amy, Super cute project!. Love the colors and the glossy accents topping. This is super cute! I take the kids every friday to our local ice cream shoppe for a special ice cream treat. Thanks for sharing. Great home decor for an ice cream lover! Very cute! TFS! Wow! This card is so adorable! I love the shadow box, the chocolate looks so real! A yummy gift for someone special. Thanks for sharing. Simply sweet and always a beautiful project to inspire us. What a neat idea! I cenrtainly could used that at home all of us aremIcecream lovers;) ok, you twisted my arm ;) I have to get this set... TFS all your talent with us Amy! Oh Amy this is adorable!!! I love the way you made the chocolate ice cream!!! Really cute project. I love shadowboxes! Thanks for sharing! LOVE that the chocolate syrup looks so real. Nice job! ADORABLE!!! What a wonderful idea! I think everything you made this week was fabulous - but I think this one might be my favorite! LOVE it! What a neat idea! I love the glossy accents too. oh my! I have liked all 3 of your projects this week, but today's I think is my favorite! great job! thanks for sharing all your talents with us! I love this! The glossy accents add the perfect touch! I love this card. The color combo is one of my favorites! Thanks for the chance to win!! mmmmm, Amy-the icecream looks yummy, but I must say I liked your layout with the cupcake--I am partial to cupcakes ; ). I love this one... So cute! I really like your home decor item with the ice cream cones but I think my favorite project you did this week is your black and white mustache card. I really liked that one the best. Thanks for sharing. 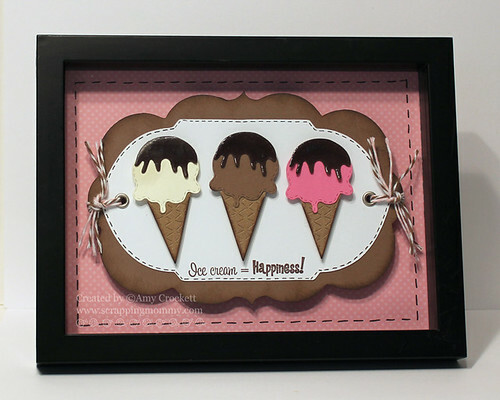 Love your shadowbax frame - the ice cream cones look great and love the colours you chose! Wow, your frame is adorable!! Love the ice cream cones. Amazing shadow box... the chocolate looks so real! amazing release! What a great way to use the stamps and die!! So pretty!! Amy: this shadow box is so yummy. I never try to do a frame. I like the idea. Thanks for share, and happy day. I love this card!!! I got to get me some of these stamp die sets!!! The hot fudge is so amazing Super cute project. OMG! What a BEAUTIFUL shadow box frame! It looks so YUMMY :). Thanks for sharing your ADORABLE projects throughout the week! You are all so talented! Have a wonderful day! Very cute. I love how you made all different flavors of icecream. Very cute framed piece--I like this color combo. My favorite project this week was your Father's Day card. It sure equals happiness for my daughter! She loves her ice cream! Oh so cute (and delicious looking) Love this card. Great job. oh my goodness!! this is too cute!! I love the glossy accent detail I need to do that! What a cute idea to frame it! This would make a cute table topper for an ice cream party :) I loved ALL your projects this week! This is so very cute! Love it! I love the ice cream and tags, but I really love your Father's Day card, the colors are awesome and the look is so cute! so so cute! Great idea! I LOVE the glossy accents. Amy, Your ice cream picture is adorable!!! What a great and yummy looking project! awesome job, thanks for all the ideas!!!! Love all the colors on this card!!! Very cute and creative!!! This is so sweet. I really love the brown combo with the pink. Emma's so generous. So thankful that I have been able to hop along. amy, I love this! I would have never thought to make a home decor project!!! I LOVE this shadow box - so creative, so much detail ~ GREAT job! Super cute Idea. I thought at first it was a tray but I like the shaddow box idea. Great job and loving the cones. Yummy. Love the ice cream in the shadow box, but I think my fav is the whimsical Father's Day card you made on day 2. Everytime I look at it I smile. Ice cream is so cute!!! Thanks for sharing! I immediately wanted to head to the freezer for ice cream!!! I am just freaking out over Emma's release this time....AMAZING!!! LOVE your project...it turned out SOOOO sweet!!! Very cute card! I think this stamp set and die is my favorite.! Hi Love the new release and what u have made with it. You have outdone yourself using emmas great stamps. Ice cream yum!! Love your framed art. TFS. Adorable! LOVE the colors! I think it turned out super! This is just adorable. They look good enough to eat! I love the shiny "chocolate syrup" on top of those cones. Great job! I love the ice cream cones and the way you did the chocolate on top. I think that set has to be one of my favorites. Off to the next blog for some more great ideas. What a great card!! Thank you Emma & Amy!! I love your unique use of the ice cream. Very elegant. Cute shadow box. Love the way you used the glossy accents. What a beautiful shadow box Amy! Love the soft pink polka dot background paper! And those ice creams are super yummy! What a yummy looking shadowbox. So very cute!! Amy this came out so cute!!! You did an awesome job. What a darling shadow box,love the Glossy Accents on the chocolate icing, perfect touch. This is adorable. I love ice cream cones and all the different ways they can be decorated. Thanks for sharing!! The ice cream dies look fab! Adorable frame project- my husband would definately agree with the sentiment. Oh my, Amy! This is super cute! I just love that idea to make a shadow box. Great job! You have done an awesome job. You do beautiful work! Love the colors on this one! Totally YUMMY! love your home decor piece, what a great idea!! Ice cream does equal happiness! You're shadow box looks so yummy that I could just eat it up! Lol. Fabulous job and thanks so much for sharing! Everytime I look at this card I start drooling!!! That fudge topping looks so real I want to lick it! This looks good enough to eat! I really like the look that the glossy accents gives to the ice cream topping - yum! After being out on the field all week, it is a lovely moment to sit down this morning and enjoy your post. i hope to get to some card making this afternoonif i'm not too long on this hop! Thank you for sharing your project. What a cute and "sweet" idea! Just might need to scraplift that one LOL! What a super cute project and it looks delicious. I love your ice cream card the best! So cute!! Love the glossy look of the chocolate syrup! I just love this card it is so cute. Amy ~ HOW FABULOUS is your shadowbox! OMG! Okay I LOVE how you popped the cones up for dimension, the shape, the glossy accents ~ okay the paper ~ just EVERYTHING! As always Amy ~ AMAZING job! I really need to do a shadowbox ~ you just inspired me! This was one awesome release! Love it! Absolutely adore the Love Me Some Ice Cream. So cute!! Cute idea!! My favorite project from this week is a toss up between the Father's Day card and the layout. TFS! Yes, ice cream IS happiness. Love the shadow box! Yes, I've been very inspired by the blog hop! Super adorable. I love the color combo and the fudge looks yummy. I love how you added the chocolate sauce, it looks so real. Oh how yummy!! Love it!